Several of you have expressed an interest in Farm Goal '10's "Revisit the creek crossing." I'm always interested to see what clever ideas people come up with, especially while we're in the planning stages. (We'll be in the planning stages for another couple of months until the water warms up.) So here's some extra info to get those creative juices flowing. The drawing here is a top view of the creek crossing area. As you can see, the creek is relatively shallow a lot of the time, but regularly rises to 16 to 20 inches after normal rains. About once a month, it rises to the top of (and over) its approximately five foot high banks, at which point it washes away anything that isn't securely bolted down. Creek crossing 1.0 is a cinderblock ford that still works perfectly for its purpose --- getting vehicles across the creek when the water is no more than two feet high. However, we really only drive across the creek a few times a month. This year's priority refers to the much more frequent times that we walk across. Just so you know, we don't want a big, fancy bridge to drive across --- we like our moat. Creek crossing 2.0 was a footbridge that we built from trees felled on the property. It lasted for about two years, and was nearly perfect. The only flaw was that everyone except me, Mark, and my mom refused to walk across it because the five foot drop below it terrified them. Wimps. :-) One option would be to rebuild a similar footbridge, but actually spend a little bit of money for treated lumber and add a handrail. To deal with high water, it would probably need to be about twenty feet long. Creek crossing 3.0 consists of three cinderblocks placed along the edge of the ford. When the water is only a foot deep (80% of the time), these are actually one of the best crossing options. You hop from block to block and keep your feet dry. They can be a bit wobbly, but folks seem to be less scared of them than of the footbridge. They do wash away during floods, though. 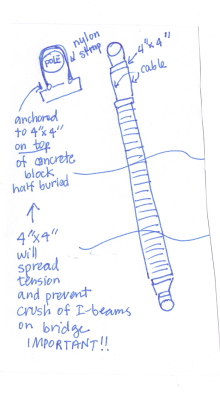 One option we're considering is building a more high tech version of creek crossing 3.0 --- cementing stepping stones to the bottom of the creek using rebar and making them two blocks high to accommodate higher water. Or perhaps three blocks high with half of the bottom block sunk into the creek bottom. Not sure if we'd need to make the stepping stone four blocks in diameter like this drawing to make people feel comfortable or just two. There's also a log spanning the creek that we shimmy across when desperate to get in or out during extremely high water. This is vastly suboptimal, and we've considering replacing it with two ziplines --- one to take you across the creek and the other to take you back. When I started researching ziplines, though, they looked to be out of our price range for our current creek crossing plans. I'm not interested in spending more than $100 on the creek right now. Plus, clearly the folks who wouldn't walk across the footbridge are unlikely to brave a zipline, so we'd have to create an alternative option anyway. So, what do you think? Bridge, stepping stones, zipline, or another option entirely? I'd love to see links to other websites where people have installed low cost creek crossings. Just keep in mind that anything less than five or six feet off the creek bottom will be washed away unless extremely securely attached. Check out our ebook about starting a microbusiness on a shoestring. I would build a large cinder block island about mid span on the down stream side of the main ford. Then use logs like from your other bridge that washed away. By having the center support your bridge sections can be smaller. Just be sure to build a sturdy center "island" working now while the flows are lowest, you should be able to work on dry ground. 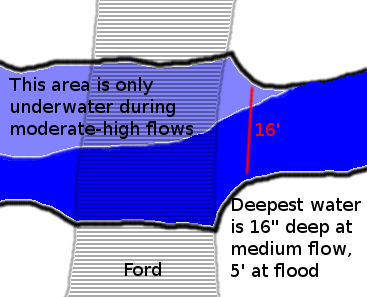 3 x 3 brick pattern two or three high set on a diamond, so a corner is pointing upstream, this will divert the water better than a flat side to the flow. 3 x 3 with concrete filled inside the bricks, should provide a flood resistant base. Use the bricks like there are in the ford...then you will need less concrete. My vote would likely be a foot traffic sized suspension bridge for a permanent solution. I saw a great one last week near Bat Cave, NC. someone had gotten a junked flatbed tractor trailer and had it placed over their creek...instant heavy duty bridge. Another simple walking bridge is to go to the metal recycle yard and ask them to save a 20 ft. ladder when they get it. Wood planks can be placed on the ladder. Possibly you could find or make pontoons? I don't know how flooded the banks get, on either end of the current foot-bridge. Also, I don't know what you could do in a flood, to keep the pontoon (or floating) bridge from being skewed (tho possibly you could have piers on either bank, to raise the bridge up (by means of a crank and tackle on each bank. Tho, if you did have this ability to raise the bridge, you might be able to not have the floating bridge...) Which bring to mind a drawbridge system, which takes up each side, so a bigger boat (in this case, flood) can get through. The advantage of a draw-bridge is, you can operate it for only the company you want. At our old Farm, we finally had those metal barrels, that the creek went through, but for you, if you used barrels like that you would have to have them at least 2 layers high, bolted together, anchored down, etc. I personally hope you can figure out a foot-bridge, not the steppingstones, unless you actually put the "steppingstones" inside the metal barrels (with the openings facing up and downstream), and some kind of platforms on top of the barrels, for folks like me who need a bigger perch. Could you build piers on either bank, to hold up a modified drawbridge from each bank, without causing the flooded creek to wash out those banks and piers?? I kind of think that bridging a creek might be an area that the county Extension Service might have expertise on (you might even get some $ help, not for a state-mantained swinging bridge, but maybe for an engineer). I bet if you talked it over with ASD they could help...The whole reason you need a better way in and out is to be able to plan for being able to come and go as needed, so your place is more "viable". Steve might know of somone to trust, in Scott Co.
Moontreeranch --- I like your idea of how to build a pier in the middle of the creek, but I've been on the fence for quite a while about whether any pier in the creek would hold up under flood conditions. When it floods, we regularly get medium-sized trees washing down the creek and they will lodge against anything in the middle like that. Have you had experience building a pier like that? How strong is it? Would it hold up to being battered by a tree every month or so? Dudley --- I forgot to mention in my list that we'd actually considered an option a lot like your option 1, but with the frame of a mobile home. Mark found one that he could get cheap. Unfortunately, the concept of hauling it seemed out of our league! Your ladder, on the other hand, sounds really cheap and just our cup of tea --- intriguing!! The barrels you mention don't work in our creek. The neighbor upstream put in those metal tunnels --- it took three to span the creek, and in the first big flood one washed out. They're just too much of a hindrance to the water. Everybody --- I'd love to hear some more great ideas like these! Unfortunately, the dirt around the creek is soft, muddy silt. We had good luck getting the ford to stay in place by driving fenceposts and rebar through some of the blocks and cementing them in place with concrete, but along the banks even that is unlikely to be helpful as the water constantly undercuts the bank. Steps are fine. We really don't want to build anything fancy (aka expensive and time-consuming) enough for the golf cart to go across --- it goes across the ford great. And when we want to wheel things across, we just attach them to the golf cart. Think foot traffic! We got really lucky with finding some building materials for free at a similar type of place that you're talking about, but it was a one time thing. We haven't gotten lucky on finding other cheap building materials yet. Okay - I see trees on opposite banks. What's the measurement from the left side of the close tree to the left side of the tree on the other side of the bank? I'm thinking strap anchors here on a concrete block base. They look hefty enough to be your "posts" for long lasting support. Unfortunately, it just started pouring, so you'll have to bear with my guesstimate. Assume this has quite a bit of wiggle room in it --- I'm notoriously bad at estimating spatially. The distance between the telephone poles is where I get a bit hazy --- maybe 25 to 35 feet? Now here is a great option, and you should just get over the length on the bridge, because once you build it, you'll be done with it. You wont be able to put a nail or screw in them but I doubt anyone will have a problem with a strap, even a wire cable strap. Are the banks high enough there to avoid the highest flood level? I'm assuming yes because they put the telephone poles there. Now I need to make a drawing. Once you have the length I can call my lumber wizard and find out the right size I-beams for that span, It may be cheaper to go with 3 smaller or it may be better to go with just two larger. Prices vary so much you'll have to make some calls. Titus --- that's where I was getting stuck on the telephone poles --- figuring the company might not be pleased with us screwing into them. But if you can figure out a way to strap onto them, that would be awesome! The banks are high enough to pretty much avoid the highest flood level --- the water backs up a bit past there a few times a year, but it's slow water that won't hurt anything. Titus --- Okay, so you're going to laugh at me. I did warn you that my guesstimates are often off.... It's actually 75 feet from pole to pole. I had forgotten that one of the poles is about 30 feet from the creek. A park just outside DC has stepping piers across a creek which are big around as a bucket and three feet tall, poured out of concrete. Did you walk on them? Did they feel too high and scary or pretty good? Kristin and I both walked on them and they didn't seem scary, because they were large enough on top. Did you walk there with me? It was just past the beltway, heading up toward Great Falls, VA.
Oh yeah! I think I might have. Do you remember roughly how far apart they were? The distance won't be daunting because your strapping will span the rest of the way to the far off pole, but in this case, I'd make sure to use galvanized wire and use a come along to make is just secure enough to not move, but not secure enough to play a tune. Your mom's video cracked me up! It's something I would have gone for completely if you had folks who tubed or paddled you creek on a regular basis! And what the telephone folks don't know won't hurt them. The duff is going to cover up most of what I'm planning. So how far past the closer pole to the river does the water rise? Now if the phone would just STOP ringing! I only remember they were doable for an average person. On the other hand, the stream wasn't a likely to flood as yours, probably. Titus --- Ooh, didn't think of attaching to the poles right at the base where no one would see it. Smart! Actually, I don't think that the water goes past the poles, now that I've looked at them again. Well, it does when the entire floodplain backs up and it's underwater for another thirty feet in every direction, but that's just ponding and it goes down in a day or so. 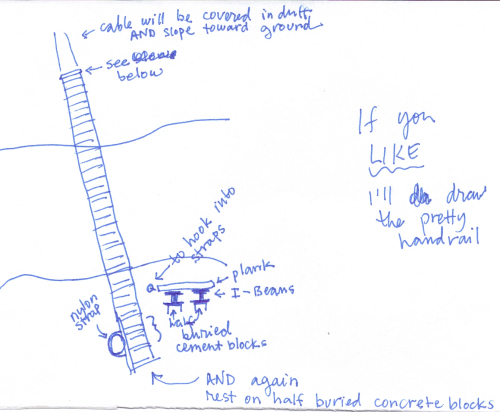 I can't stop thinking about Shannon's concept of a swinging bridge. Since so many people in our area build swinging bridges in this our type of situation, I figure they must be onto something. My question is --- can they built for our under $100 and under 1 week's work budget? How long until you guys plan on doing this? Thanks, Titus! I'm going to have to ponder these a while --- my brain is about done for the day. I've done some of these for fun and yes rope will do it, but for longevity don't use a natural fiber unless it's hemp. AS for synthetics, you need to choose a rope that doesn't deteriorate in the sun. I'm a retired merchant marine officer & marlinspike seamanship is one of my fortes. The problem I see is that you don't have trees and you can't use the telephone poles for this. You'd have to auger in posts that go at least 6-10 foot deep to handle the stain plus anchor them. In the Rockies I would feel safe with 5 foot deep on both my posts and anchors, but with the soil you are describing...I just don't know. I've designed & built a bunch of rope courses as well and I'm coming up with similar issues. (Of course much of my rope course obstacles would freak out your guests even more than your existing bridge...) As for your railing, I have a hammock style weave on which you can train a nice water loving shrubbery to grow into from the banks on each side. You didn't think I'd let you get away without some decorative know work now did you? Anonymous --- That's a lot cheaper for the cable than I thought it would be! It looks like shipping isn't exorbitant either --- the whole shebang would come to about $40. Of course, Daddy pointed out to me on the phone that the most expensive part of a swinging bridge is probably the supports on either end --- they need to be pretty high and solid. But we might be able to use trees or something cheap. It looks like the swinging bridge is still in the running! Meanwhile, Daddy called me and told me that he thinks our cheapest option would be to buy two used telephone poles and use them to span the creek. Quite possibly he's right. Or, he said, use smaller pieces of treated lumber to create an arched bridge --- the arch gives it stability. As for time frame --- sometime in 2010, hopefully. If we're going to be working in the water, we'll probably wait until spring when the water is warmer (and hopefully lower.) If not, maybe sooner. Titus --- I love your water-loving shrub idea. I'll have to go look at all of the trees along the part of the creek I own. It almost sounds like if I found the right two sturdy trees, we could do the rope bridge, which would be awfully cool! It'd be worth a short walk out of our way in that case. Tomorrow, I'll go scouting for trees! A suspension bridge might be interesting enough of a project to get me out to visit! If I plan it right, I might visit just to help with this. I'm stuck here for at least the next 5 weeks for a class though. I think I'm following you just about everywhere, except I'm getting lost on the second parabola. I think you're saying that one is concave and one is convex, but I'm clearly missing something since a wire strung between two trees is going to sag down in the middle due to gravity --- how could it sag up? I think it must be passing my optimal brain time. One more question (for both Shannon and Titus) --- about how big around would you want a tree to be to figure it's strong enough for this application? And now, off to wind down and fall asleep. I'll check in on the conversation in the morning! I really don't understand the concern of anchoring behind the trees. If you were tied across two 6 inch trees at 3ft, ya they might lean a little but not enough to harm the tree or the bridge and you certainly aren't going to uproot the tree. We used to make rope bridges all the time in boy scouts when I was a kid. With good rope (marine grade) this could last many years. I like the reverse arch idea to limit the sway, but this puts all the load on the upper ropes. You can wrap around one tree and use a spreader board (like on the ends of a hammack) to get the desired width. I could be wrong, but I think the concern about anchoring is if I can't find good trees and we had to use posts. Hopefully, trees would be anchored well enough by themselves! Awake this morning --- finally et the reverse arch idea. A properly built drawbridge is very easy to raise, by using a counteweight. These kinds of bridges are abundant here in the Netherlands. Follow the link for the Dutch term "ophaalbrug" for lots of pictures. Especially the smaller wooden ones are made so that they can be raised and lowered by a single person. Check out the websites of wedeka and wijma, two Dutch bridge builders. You won't understand the text, but there are lots of pretty pictures. If you have enough wood available on your property, building one is just a question of time. As for foundations in soggy or muddy soil, you'll need to go to an underlying supporting layer. The solution is to drive wooden posts (piles) into the ground untill they will go no further. That means you'll have reached proper support. Cut off the piles below the water level, so they won't rot. The whole city of Amsterdam is built with buildings supported on wooden poles driven into the ground. E.g. the palace on dam square was built on 13,659 wooden piles. 350 years later, it's still standing. You can then pour concrete over the ends of the posts to have a solid base for your bridge. If you can get someone with a pile driver to come by, that's a quick way to do it, but probably outside your budget. Small posts you can drive in with a mallet or a post-pounder. The Roman pile-driver (see the wikipedia article) also works well, but takes time to build and is slow. Some experimental archeologists in Germany built a replica of such a Roman pile driver to see if it had been possible to create bridges over the Rhine that way. On TV I saw it used to hammer what was essentially a whole tree trunk about a foot in diameter into a riverbed. It wasn't fast, quite impressive nontheless. I think the simplest and cheapest solution is to build a pontoon bridge using 50 gallon drums (floating on their sides as pontoons), synthetic rope and some planks. Just lash them together with the rope. Anchor it firmly on one side, e.g. to suitable trees, and the other end lightly. So if an uprooted tree comes down the creek, it might sweep the bridge away but won't destroy it. A slightly sturdier version is to weld flanges to the drums with bolts running through the flanges and fixed to the planks with omega clanmps. The puspose of this construction is to make the whole thing sturdy but flexible. Of course the steel drums will eventually rot, and you'll need to replace the rope every now and then. Roland -- thanks so much for posting those links! Those are such cool pictures --- human-sized drawbridges! I've never seen such a thing. Remember that load-carrying ropes will experience forces way higher than the weight of the load! Suppose a 200lb person is standing in the middle of the bridge. The ropes will then hang in a wide v shape. Suppose the ropes have a one in five slope (one foot up for for five horizontal). The ropes will then have to carry a tensile load of slightly over 500lb. If the slope is one in ten, it's a 1000lb load. That's not much for good-quality rope; 10mm nylon climbing rope can have a static breaking strength of around 4000lb, but much less for dynamic loads. But I would advise you to use at least a safety factor of 10, because the strength of rope decreases as it ages, and you'll have to take in account dynamic loads. And remember that knotting a rope can reduce the strength by as much as a factor of four! It's much better to splice rope. Google 'rope splicing' and you'll find lots of instructions, with pictures. As for tying down the ropes, I'd go for solid 3 inch wooden fenceposts hammered 2-3 feet deep into the ground at 30 degrees from vertical away from the load. Slip the spliced loop around the post at ground level, and raise the rope over another post. But not more that 30 degrees from horizontal, so that the rope will never slip from the anchor post. The reason for doing this instead of e.g. tying around a tree is that you can test how many posts you need. Have a friend with a tractor or pickup come over and try to pull a testpole over. If the rope breaks before the pole pulls out of the ground, you're good. With a tree you'll never know how strong it is until it falls down on you while you're crossing your bridge. The simple suspension bridge article on wikipedia has some nice pictures. Note how the Soderskar bridge in the picture is hanging on two steel cables that look about an inch thick! Of course you don't have to go so complicated. The Inca's have been building grass rope bridges for centuries. Note that they only last about a year, though. Please find attached a sketch for a bridge as atensegrity1 structure. I'm emailing this because I don't think the comment box allows for adding pictures. Basically the structure consists of a wooden arc, with the ends held together with a steel cable. The wooden arc is then loaded in compression, and the wires are loaded in tension. No load (save from the weight, of course) is transmitted to the environment. 1) It doesn't need a lot of infrastructure; the environment only needs to support the weight, it doesn't need to absorb stresses like when using suspension bridge, or a normal arced bridge, see the sketch. 2) It uses the materials efficiently. Wood is stronger in compression than in tension (Low-grade wood is about twice as strong in compression as in tension) , while (steel) wire is excellent at withstanding tension, but not compression. 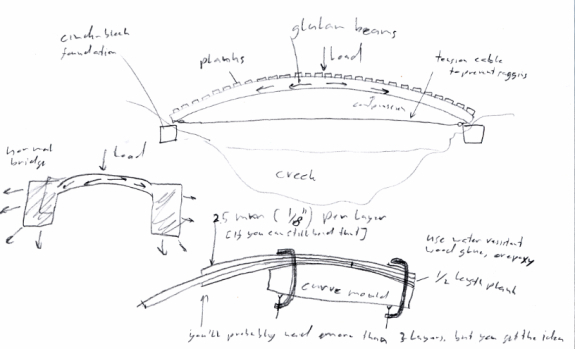 Because it is nearly impossible to find nicely curved wood of sufficient length, I propose to make it as a glulam2 beam. You can find design data for the US on the AITC3 website, under technical information. Make two of these arcs, put them next to eachother with boards running perpendicular to the length as the deck. Now for the tensegrity bit; Put some heavy duty eye-bolts or clamps on the undersides of the ends of the arches, and put a steel wire between them with a tensioner, and tighten it until it is taut. When someone is standing on it, this will keep the glulam beams loaded only in compression, meaning you'll only need a much smaller cross-section of the beams. (Normally when you'd stand on an arc, it will want to flatten, pushing the outsides out, and loading the underside of the arc in tension. The wire prevents this). If you have enough wood on your property, it should not be very expensive to build. You could even saw boards with a chainsaw and a chainsaw-mill4 , but you'd end up with a lot of extra mulch. The wood would need to dry, though. I'd never heard of tensegrity --- very interesting! We actually have a small chainsaw mill, but it seems to take a lot of practice to make the boards come out flat. I like the idea, but it sounds like a lot of nitpicky details --- probably more than we plan to take on for our creek project. Engineering is part science and part art. No matter what method of building a bridge you pick, the devil is always in the details. So true! The question is whether we can pick a design where the details aren't too devilish. Hello everyone. Im from canada and actually havent built any bridges but am a carpenter. I think if you could get some fence posts pounded into your river bed for cheap this would be the best thing in the long haul. Just set some fence posts spaced 8 to 10 feet apart in two rows using a string line. Use some 2 by 10s fastened along the edge of the fence posts in between the two rows lengthwise. Then set your planks across the 2 by tens. When installing 2by 10s set at least a foot above expected water level. The wood shouldnt rot to fast since fence posts are usaully treated. Depending on what size trees or branches come down the river would determine the spaceing of your posts. Thanks for the idea! We'd have to use pretty tall fenceposts --- the creek regularly floods to more than five feet high, and anything in its way tends to get battered by trees and washed away. You can buy a 53 flat bed trailer that DOT has labeled unsafe for $500 to $1500. I traded a local logger the tires, axles, etc for hauling it to my spot and he even put in in place with his logging equipment. I put 4 light poles about 4 feet deep at each end right against the trailer (SNUG)I then used some discarded guide wire just in case it tried to float. It gets covered by 6+ feet of water several times per year and has never moved. It's strong enough to drive a truck or tractor across. No matter what you build be sure to put it in s straight part of the drain. Curves cause more flow resistance. Not counting replacing boards it took us one day to install. Good luck!!! We've actually considered building a bridge very much like that (but with the metal foundation of a burnt out house trailer), but if you don't get lucky, hauling and moving the trailer costs an arm and a leg. If we had a handy logger willing to trade, though, we'd give it a try! I like the idea to use cinderblocks for a creek crossing. 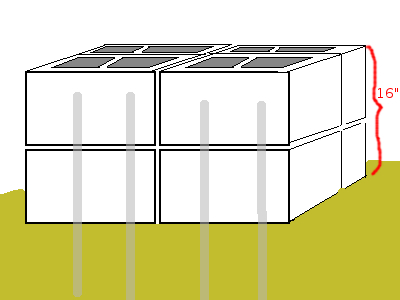 However, i think it would also make sense to stack the blocks with the holes on the sides....allowing for the water to pass though the blocks, as opposed to over them. Just my 2 cents. Great ideas guys. If you still want just a low water crossing, I saw one in Tennessee one time that looked like those concrete curbs they use at the front of a parking space in parking lots. Only difference is they were strung together with long links of rebar so it just lays in the creek bottom like wood rungs of a walking hanging bridge. The rebar keeps them all in place yet they just move enough to settle on the bottom and water runs between them and over them during high water. If I wanted a crossing, that's what I'd do. You could make those your self easy. Just dig a row of forms in the dirt and lay rebar down so it goes through them all. When it's hard drag it all in to the crossing. You could pour them one at a time if you want to mix your own or just call a truck to come fill them all once it's set up.